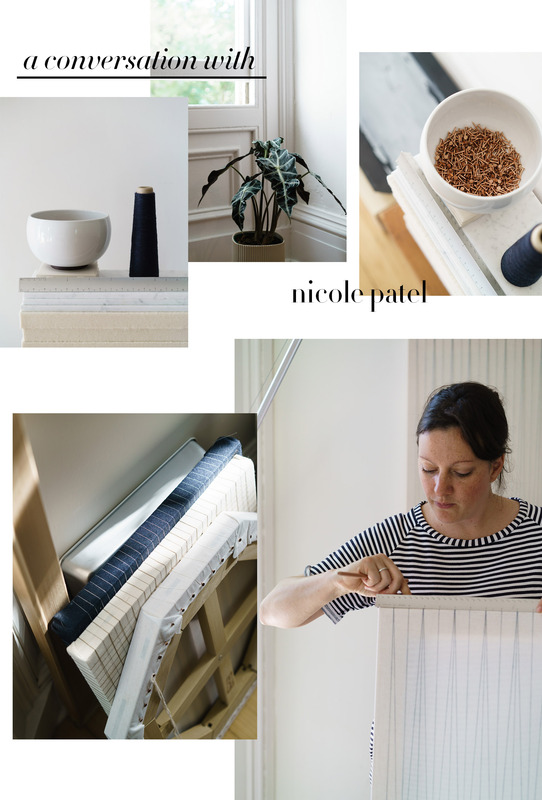 When I first came across Nicole Patel's beautiful grid work (via Rosa of Cereal), I immediately felt a sense of calm. I wanted more. I exclaimed to anyone who might care and showed them her pieces, "I love this artist's work!" 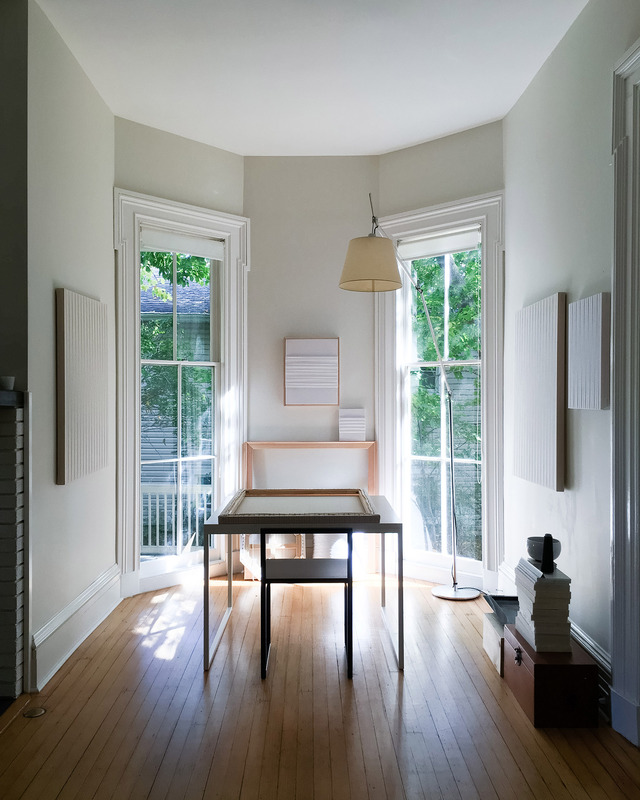 I was drawn to photos of her home in Nyack as well, which gave me a similar calm feeling. Clearly she knew a thing or two about interiors as well. We eventually started chatting and connected in real life. When Nicole came over one day to talk about doing a piece for me, I gave her the "grand tour" of my apartment and basically begged for organizing advice (if you saw the insides of my closets, you'd understand why). 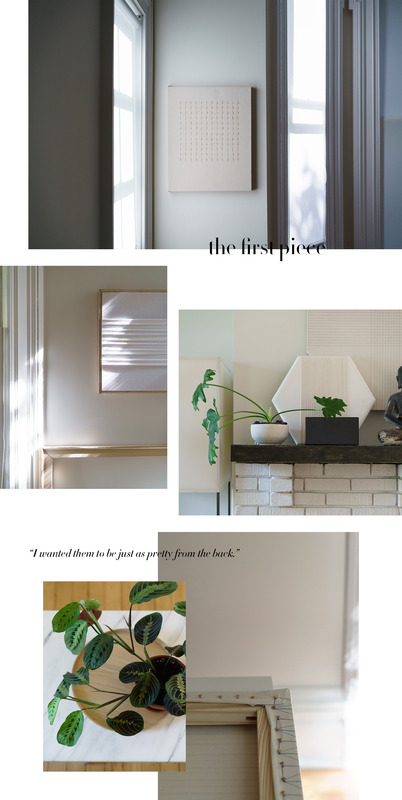 I recently had the chance to visit her home and studio, and I left feeling incredibly inspired by Nicole's thoughtfulness about her work, approach, and intentions. I hope you'll also enjoy this conversation with her. How did you get started in your current series of work? My current series is a collection of Bridges. It originated many months ago when I saw the documentary about the architect Sir Norman Foster. The Millau Viaduct in France was featured and the first sight of it inspired me immensely. It is a mastery of structure, sweeping and expansive, made up of a simple shift of equal line weights. I was simultaneously seeking to simulate what I love about blueprints within my work, and I began working with a Sky Blue Japanese Merino thread for its color and heathered line quality. Eventually after enough time, the Bridge manifested, and it held a space for that undulating grace that I longed to emulate. When I think about what my biggest inspiration is on a daily basis, my intention is to help people in some way. When I was studying fine art at University I had an inkling to be an art therapist. Later in life I developed my own company called Homework. I worked as a holistic interior designer. It was essentially home organizing and interior design, with an aim to optimize people’s quality of life by clarifying their home. 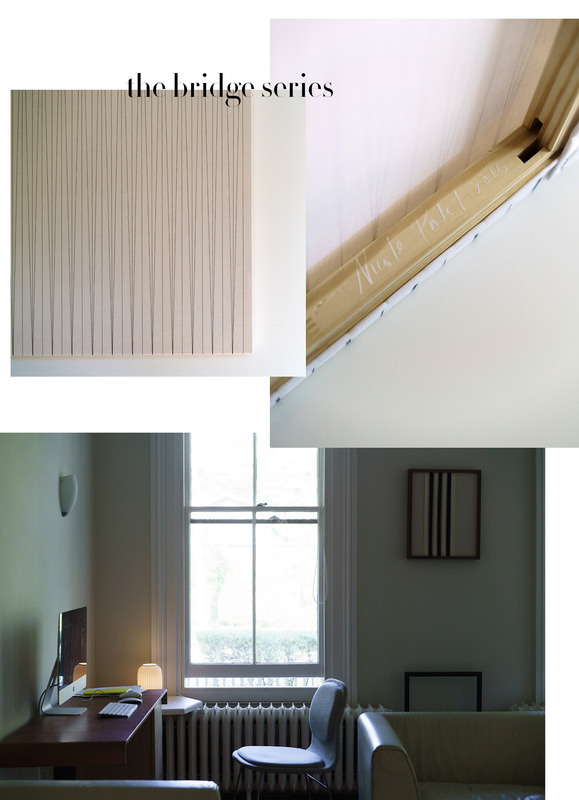 Eventually I grew into working as a fine artist doing the work I am known for now, but my objective remains the same – helping people feel a sense of peace and clarity in their home by holding a space for simplicity. I tend to gravitate towards materials that are in some way pure. That largely becomes natural materials such as cotton, wool and marble, but it also includes plaster. So more than natural materials, I enjoy working with materials that are the foundation for other art forms. The muslin, for example, is the blank canvas of fashion, marble the bedrock of classical sculpture, plaster used in casting clay, etc. Someone likened my work to the experience of perusing a stationery store and selecting a notebook, holding so much possibility in those blank pages, and that is indeed what I want to offer – that unadulterated potential that a given material holds. 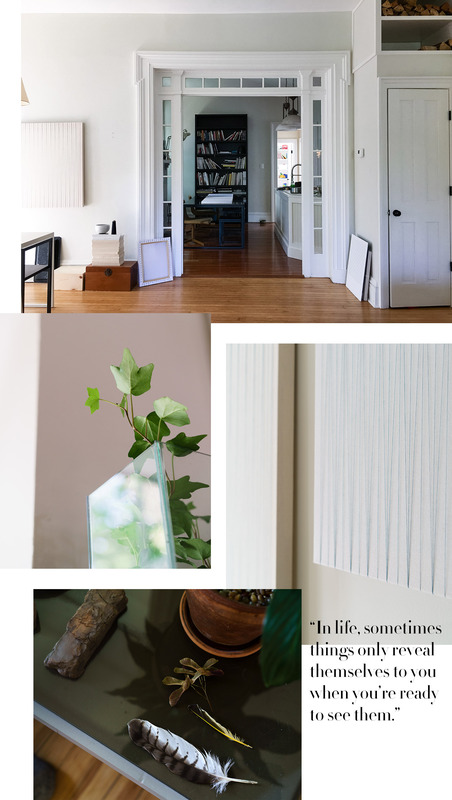 What influences your interior aesthetic? And what were you trying to achieve when putting together your workspace? I am always working to turn down visual noise, and the furnishing is simple enough to be a platform for the daily activities. I continually transition from working on my art to being a mom, to housekeeping, and to administrative tasks throughout the day. They are all in the same space, so there is no boundary between my work and the rest of my life and I think that's how I'm most productive. What kind of state of mind are you in when you're actively creating and putting together your grids? Seeking – if it's a new piece or style I am seeking something, a fine line between what I feel appeals to both the intellect and the spirit. I always try several iterations and let them percolate. I live with them to understand their presence. They need to be understated and attractive, and also have enduring appeal. Do some of the grids happen spontaneously or do you pre-plan all of them? I have decide to produce my work in limited editions of twelve. So sometimes I have to stick to the plan and recreate a formula, which is possible but challenging for me. As an artist, once I have the foundation laid out, I set out on a journey but always want to take a new scenic route! So often times when I am intending to repeat myself I follow my intuition instead and new piece is born. It reminds me of one winter I was making a chicken soup for some friends who were visiting. I had the classic ingredients and then some, and my mind thought to make numerous alternative versions. I began to say to myself, “Just make the soup, just make the soup." I followed through with a most classic version and when my guest tasted it he remarked that it reminded him of his Jewish grandmother’s chicken soup. It was one of the best compliments I've had on my cooking, and I was so happy I stayed on task! Can you share some of your favorite books for inspiration? A few places you can find or purchase Nicole's work: Nalata Nalata (in the physical store), Cereal's online shop, and C'H'C'M. And of course you can contact Nicole directly via her website for pieces. Such a beautiful place for your dean hotel you have done great post . every one showing their interest in this type of hotels keep sharing this type of post .